As a huge fan of horror rock n' roll I thought I'd spend a little time looking at some of the pioneers of the genre. 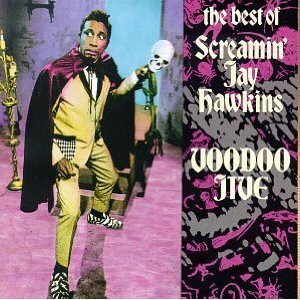 There are lots of bands that might have dabbled in horror with a song here and there, but any true discussion of horror rock has to start with Screaming Jay Hawkins. Screaming Jay was born in Cleveland Ohio on July 18, 1929. He studied music as a child, and performed as a musician in the Air Force during WWII. 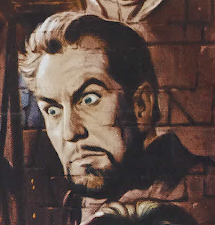 He began a career as a blues singer after the military, and the fateful day that started his legend as a horror performer happened when he recorded his signature song, I PUT A SPELL ON YOU. It was a huge success and afterwards he was offered $300 by radio deejay Alan Freed to emerge from a coffin onstage. He accepted and the coffin became a regular stage prop. He kept coffins in various cities across the country so he wouldn't have to cart one around all the time. His onstage persona began to slowly become more horror oriented, and he began utilizing many other horror props onstage. The most famous of these was Henry, a skull on a stick that he would carry onstage and shake at audiences, even addressing Henry onstage between songs. The moniker Screamin' was an apt one as Screamin' Jay Hawkins had a huge, booming voice, one that was powerful and instantly recognizable.He would go on to influence many other bands, many of which I'll look at over the next few weeks. 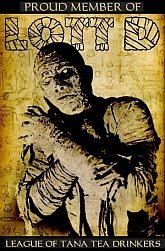 Here's to you, Screamin' Jay, for all your crazy, scary, bluesy rockin horror tunes - Feast of the Mau Mau, I put a Spell On You, Alligator Wine, Voodoo, Frenzy, The Constipation Blues... insane genius! This video is from 1984 - Screamin' Jay got up onstage and performed with legendary garage rockers The Fuzztones. It was surely the highlight of their career!!! Just listen to this cat GO! !